A new British Leyland car announced today has been designed, developed and is being made in Australia but will be available in Britain next year, priced between £3,500 and £4,000. Called the Leyland P76. it is the first car to bear the Leyland name since the famous Straight Eight of the 1920s. The P76 is a large, five to six seat saloon and is claimed to provide American-style comfort with European style handling. It is powered by a 2.6 litre inline six-cylinder engine developed from the Maxi’s power unit, or an enlarged version of the Rover V8 of 4.4 litre capacity. Design is conventional, with a front-mounted engine driving non-independently suspended rear wheels. 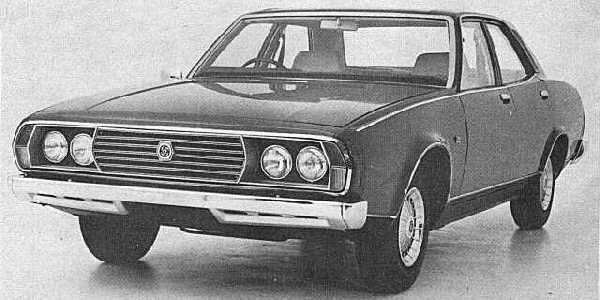 British Leyland hopes the P76 will give it a share in the large car sector of the Australian market now dominated by Holden, Ford and Chrysler. In London yesterday, Lord Stokes, British Leyland’s chairman and chief executive said the P76 was their most exciting overseas project. He hoped it would revitalize their Australian company and improve their financial situation there. The name Leyland had been chosen because of the fine reputation Leyland trucks enjoyed in Australia. Production would eventually reach 30,000 units a year. The Leyland P76, the first car to bear the Leyland name since the 1920s.